Established under the aegis of Surya World Educational Research & Charitable Initiative (SWERCI), Surya World- Institutions of Academic Excellence is an initiative of Surya Pharmaceutical Limited, a Fortune India 500 company . These institutes of higher education are approved by AICTE, COA, Government of Punjab and affiliated to Punjab Technical University (PTU) and Punjabi University ( for MBA) . To honour these young bright stars of tomorrow, Surya world Champs Felicitation Ceremony was organised was organized at Bhargava Auditorium , P.G.I. Chandigarh. It was a moment of elation and pride for more than 300 students of Class X, XI and XII of the Chandigarh Tricity, Punjab, Haryana, Himachal Pradesh when they received the Surya Champs awards from the Guest of Honour, Dr. Vidhu Mohan, former Chairperson of Department of Psychology, Punjab University. Addressing the students and the delegates in the hall packed to its capacity, Dr. Vidhu Mohan appreciated the endeavor undertaken by Surya World to inculcate the habit of making an extra effort to sharpen general knowledge and subject skills among students. She emphasized on making early career choices and highlighted various career options available to them. 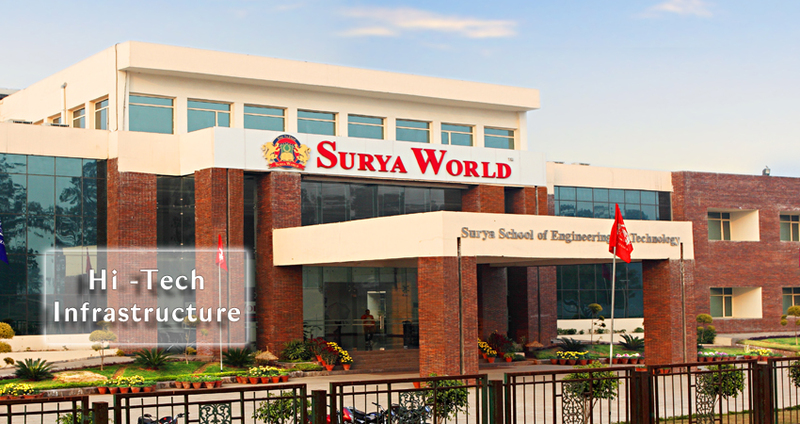 Campus: Established under the aegis of Surya World Educational Research & Charitable Initiative (SWERCI), Surya World- Institutions of Academic Excellence is an initiative of Surya Pharmaceutical Limited, a Fortune India 500 company . These institutes of higher education are approved by AICTE, COA, Government of Punjab and affiliated to Punjab Technical University (PTU) and Punjabi University ( for MBA) . Surya World offers an integrated curriculum that is designed towards delivering quality tertiary education with the highest standards of instructions, equipping the students with the requisite knowledge and skills to perform effectively in a dynamic industry environment. Ideally located on the Rajpura – Ambala section of National Highway (NH1), 45 kms from Chandigarh, the 50 acre campus with state-of-the-art infrastructure and facilities, provides perfect balance between academic excellence and extracurricular activities.